Last night was a fond walk down memory lane for any StarCraft fan. Between the announcement of StarCraft Remastered and the showmatches between old Brood War favorites like Lee Jae Dong and Lee “Flash” Young Ho, anticipation kept building for the night’s climactic battle for the Global StarCraft II League finals. Kim “Stats” Dae Yeob has been steadily rising in the scene this season, making the top four of almost every tournament he’s been to in the last six months. Signed under Splyce, Kim is the posterboy of Protoss—he’s effective, aggressive and knows how to micro-manage Adepts to win games. Sitting at the number-one spot in the WCS rankings, Kim seems all but determined to make 2017 the year he leaves a permanent mark on the StarCraft II scene. The audience favorite was definitely Eo “soO” Yoon Su, the eternal runner-up. Eo has set the record for most consecutive appearances in a GSL Code S final at four, and lost every single one of them. “soO has lost again!” is something of a meme in the Korean StarCraft community. Last night was his fifth time in the GSL Code S finals, and you can bet he wanted the win bad. The night started out rough for the runner-up, however, as Eo failed to handle the aggression of Kim’s Protoss. Zerg players, like Eo, traditionally set the pace for aggression, getting large amounts of units up and out early to swarm the opponent. Kim, however, makes use of the Protoss’ durability and flexibility to make small but effective raiding parties. Dropping Adepts into mineral lines, outgunning Eo’s Zerg forces at every step, the series started to look all but over even a few matches in. Sitting at a daunting 3-0 in the best-of-seven series, Eo found his footing in game four and started to battle back. The Zerg player was not going quietly into the night, and with a crushing Roach-Hydra push into Kim’s base, Eo kicked off the run-back. Taking two games in a row, it seemed Eo had figured out Kim’s game and was ready to take the set all the way to point. In game six, however, a climactic encounter between Eo’s army and a legion of Templar and Archons delivered a crushing blow to his forces. Eo threw in the towel, knowing he’d been beat, and Kim took the fourth win and the title of GSL Code S champion. 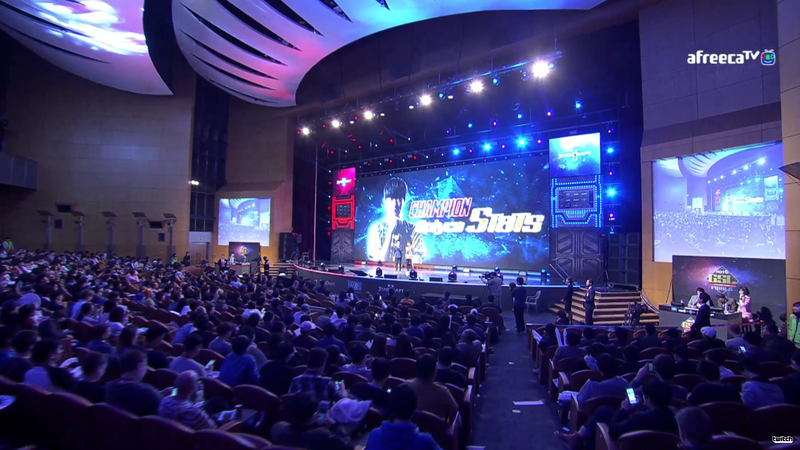 Both took the stage to thank their fans and celebrate a love for StarCraft, but as commentator Artosis puts it, “Even if he [soO] speaks no English, he probably knows how to spell runner-up by now.” Maybe next year.